Children, adolescents, and adults had gathered for a concert by pop superstar Ariana Grande and had begun to exit the Manchester venue when Abedi exploded a shrapnel-laden device — causing pandemonium, severely injuring scores, and killing 22 people. Could the Manchester attack have been prevented — even long before MI5 also warned an incident may be forthcoming? McAdams and Dr. Paul cited an article from January, 2016, from the Telegraph, titled, “Colonel Gaddafi warned Tony Blair of Islamist attacks on Europe, phone conversations reveal,” in which the content of communications between the two leaders revealed how precisely the ill-fated leader of Libya prognosticated future blowback from current Western support of radicals. “We are not fighting them, they are attacking us. I want to tell you the truth. It is not a difficult situation at all. The story is simply this: an organisation has laid down sleeping cells in North Africa. Called the Al-Qaeda Organisation in North Africa… The sleeping cells in Libya are similar to dormant cells in America before 9/11. In fact, Abedi’s very family fought Ghaddafi during the revolt in 2011. As Dr. Paul notes, Gaddafi’s desperate words weren’t intended as a threat, rather, as counsel to Blair on the deleterious repercussions manipulation by the U.S. and Western allies would reap — not only across northern Africa and the Middle East, but in Europe. Indeed, today saw headlines plastered with news Abedi’s family twice approached British Intelligence with concerns their loved one had begun entertaining terrorist fantasies. While it remains unclear whether Abedi garnered targeted surveillance from MI5, what has been made apparent is even direct and unequivocal warnings on specific persons of interest don’t necessitate an open and willing ear from perpetually — if ostensively, only — suspicious Western Intelligence agencies. Abedi’s brother, now having been arrested in Tripoli, allegedly affirmed Salman and himself to be members of the pernicious, self-titled Islamic State — and that his brother told of his plans for the Manchester attack. However, when it comes to insidious dealings of Intelligence services, the ends — and not warnings with immediacy — seem far too often to play into State decision-making. 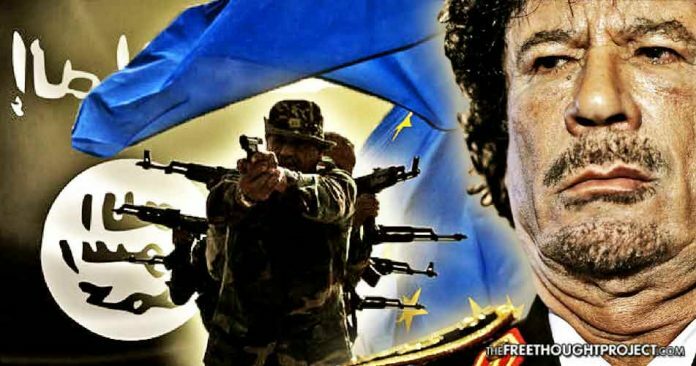 Not long after Gaddafi’s pleas to Blair and other Western leaders, his and Libya’s tragic fates were sealed. With his ouster and killing, plans to supplant the U.S. petrodollar with the gold-based African dinar — which could have brought the continent into economic relevance — could not come to fruition. And his warnings of impending doom throughout Europe — resulting from years of meddling in the cultures and affairs of governments of sovereign nations, and the manipulation of terrorist groups to serve hegemonic plunder — can now only echo in the minds of those most guilty for turning a deaf ear.